Hi guys, my name is Alex and I am currently building a super gt mr2. I run my own company building and maintaining performance/race cars and engines, we have won the uk mr2 msa championship this year. As I have decided to build my own super gt for next season I want to model it as closely to the original trd2000gt as possible. Even though I do work with the european TRD agents it appears much of the info can be very illusive. I have a few questions as I've never had the privilege of seeing one in the flesh and would be grateful of any advice or pointers. Firstly I see a few options of replica body kits around, can anyone recommend a good one from experience? Secondly are there any better photos of the required modifications to the rear quarters than the fitting instruction manual ones? Can only speak from experience of my own which is a VISRacing kit from the US. Pretty pleased with it overall - needed a bit of tweaking here and there to get it to a standard I'm happy with but nothing major. That certainly looks nice! Did it require much modification to the rear arches? Are there many other makers of the replica kits and did you import your kit or buy it over here? I am using many of the originally used tuning parts that the gt300 cars ran for the race car build so should make a very interesting car indeed. Your supposed to cut the rear arches but I couldn't bring myself to do it so "flared them" - was worried about creating a rust trap.. Yet to see if that's sufficient as car is not lowered yet which I intend to do - might end up retro cutting them but hope not! Another big maker apart from VisRacing (which seem to be regarded as best) is Extreme Dimensions but I was put off them by their attitude towards complaints on US forums. I imported the kit which worked out around £1,100 all in. They do come up now and again on eBay 2nd hand for around £400ish. I've also seen a couple of abandoned projects go for around £1000ish. Ill keep my eye out and let you know if I see anything. I know exactly what you mean, it is going to take some courage to even want to get a disc cutter near the rear arches! 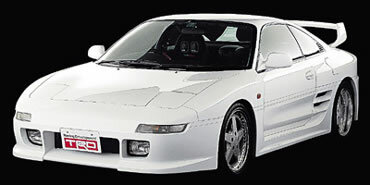 When you imported your bodykit did you deal direct with VIS? Does no one stock or make them at all in the UK?